These tiny spicy Swedish cookies are as addictive as potato chips! Because it makes so many, this Pepparkakor recipe is perfect for the holidays. Friends, neighbors and family will thoroughly enjoy this edible gift. Another benefit of baking Pepparkakor: Your house will smell like ginger and spice! In a large saucepan, melt butter. Add ginger, cardamom and cloves. Add sugar and corn syrup, mixing well after each addition. Bring to a boil and cook for 1 minute. Set aside to cool (1 to 2 hours at room temperature). In a large bowl, with a heavy-duty mixer, beat the egg. Add the cream and cooled butter mixture. While mixing on a low speed, add half the flour, 1 cup at a time. Add the baking soda. Then add the rest of the flour, 1 cup at a time. Pull off chunks of dough and roll into balls about the size of tennis balls. Wrap each individually in plastic wrap and place in a lidded bowl large enough to hold all the dough balls. Cover and refrigerate overnight. Preheat the oven to 325°F. Select 1 ball of dough while keeping the rest chilled. Pinch off a golfball-size amount of dough. On a well-floured surface, use a floured rolling pin to roll it out as thin as you can. The thinner the dough, the crispier the cookies. 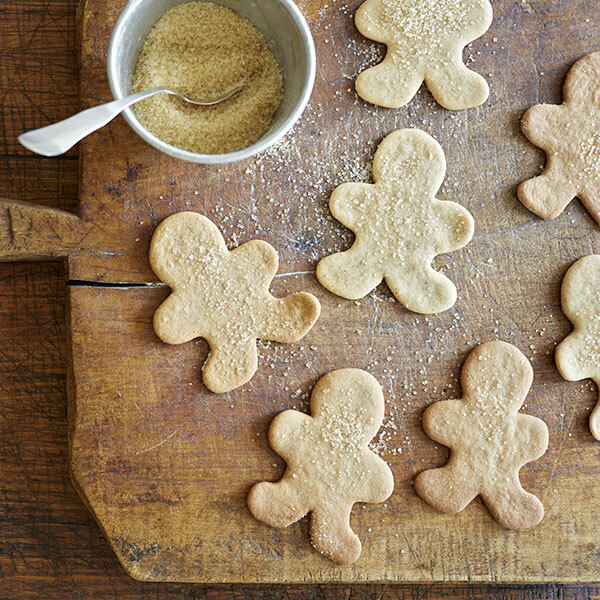 Cut out cookies with a small (2½-inch) gingerbread-man cookie cutter. Place cookies on a heavily greased baking sheet and bake for 8 to 10 minutes. Note: Watch carefully to avoid overcooking. It’s difficult to tell when these are brown because of the color of the dough.